Catwoman has been featured in many media adaptations related to Batman. 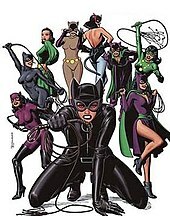 Actresses Julie Newmar, Lee Meriwether, and Eartha Kitt introduced her to a large audience on the 1960s Batman television series and the 1966 Batman film. Michelle Pfeiffer portrayed the character in 1992's Batman Returns. Halle Berry starred in 2004's Catwoman; this, however, was a critical and commercial flop and bears little similarity to the Batman character. Anne Hathaway portrayed Selina Kyle in the 2012 film The Dark Knight Rises, and a young version of Kyle was played by Camren Bicondova on the 2014 television series Gotham. Actress Lili Simmons will portray an older version of Kyle in the series finale.